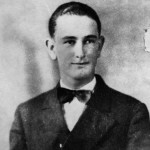 In March of 1927, Lyndon Johnson enrolled as a freshman at Southwest Texas State Teachers College, now Texas State University, in San Marcos. 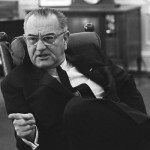 Johnson majored in history and was active in a variety of organizations. Here is a brief summary of his college years that transformed his life–and our nation! 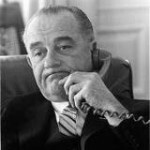 In 1928, after his freshman year, LBJ became the teacher and principal for fifth, sixth and seventh grade Mexican-American students at the segregated Welhausen School in Cotulla, Texas. He had deep sympathy for his students and the socioeconomic problems they faced, experiences that shaped his future. 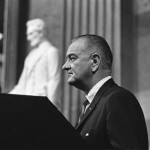 Take a short quiz that tests your knowledge of President Lyndon B. Johnson’s formative years! “Today, for the first time in all the history of the human race, a great nation is able to make and is willing to make a commitment to eradicate poverty among its people.”— President Lyndon Johnson on signing the Economic Opportunity Act of 1964. 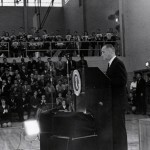 Here is a sampling of speeches by President Johnson—including the speech at Texas State University on Nov. 8, 1965 on the occasion of his signing the Higher Education Act at his alma mater in San Marcos! 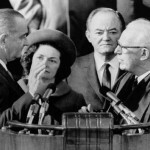 Watch videos of major speeches by President Johnson, as well as a brief clip of the grand opening of the LBJ Museum of San Marcos in 2006 with his daughter, Luci Baines Johnson, as the keynote speaker.